I was rushing to leave the market last weekend, lugging an impossibly heavy load on my shoulders, sweat dripping down my back. The sun was blazing and I had a lot to drag home in preparation for Sunday lunch with my mom, her mom, and her mom’s sister (doesn’t that sound like a fabulous movie title?). It was in this frazzled state that I saw it. A squash unlike the regular local squash I am used to seeing at the market. A squash whose vase-like shape and pale color looked tantalizingly familiar. Could it be? Here in my tropical isle that has never seen an autumn much less a winter? Despite having both arms full and feeling like you could fry an egg on my back, my feet had a will of its own and led me to the cardboard box holding the squash. I pointed and asked the purveyor what it was. “Butternut squash.” Now, let’s not get too excited. These were dwarves compared to the ones I’ve seen in pictures (yes, I have only seen butternut squash in pictures). I was a bit suspicious. “For eating?”, I asked, wanting to make sure these weren’t just bigger versions of the mini-squashes that seem to be quite en vogue as a tabletop decoration. “Yes”, was the reply. They apparently came from Baguio, our mountain province where a lot of our veggies, especially those needing cooler climes, come from. One second of deliberation, some picking and inspection, and I walked away with two small specimens. Back home I went straight to my April/May 2007 issue of Donna Hay that featured a full spread on pumpkins. I already knew I would be making pumpkin soup with one of them, now I needed an idea for the other. As always, Donna did not disappoint me. Since the squash was small I figured they would do nicely stuffed, and Donna had just the recipe: Silver Beet and Gruyere Gratin. Unfortunately, I did not have silver beet (Swiss chard), nor did I have gruyere, and the pumpkin she used was golden nugget. Technicalities. I did have some brussel sprouts (I love you brussel sprouts!) and the size of the butternut squash would be perfect. I prepared the sprouts like Molly’s cream braised ones (incredible recipe! ), I just didn’t braise them (to allow for the added cooking time in the oven), and used that to stuff the squash. Although I didn’t have gruyere, I did have some wonderful camembert de Normandie (Bernieres Jort — where they are still made with raw milk scooped by hand held ladles – au lait cru muolé à la louche), straight from France, a gift from my best friend K’s husband. I got to work. – Melt butter in a saucepan, and then toss in brussel sprouts. Gently fry until sprouts have browned in spots. – Add cream to the pan and season to taste with salt and pepper. Grate some nutmeg on top, stir, and cover for a couple of minutes. Once sprouts have softened a bit, remove from heat and set aside. – Cut squash in half lengthwise. Scoop out all the seeds and stringy parts. – Place squash halves on a baking sheet. Fill the squash hollows with brussel sprout mixture, grate a little more nutmeg on top, and top with 1 slice camembert each. 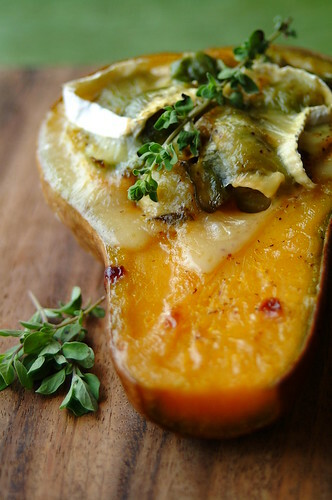 Wrap each squash in foil and place baking sheet in a 190C oven. Bake for 40 minutes to 1 hour, or until squash is soft. – Once squash is soft, remove foil. The cheese would have melted into the sprouts at this point. Turn on the broiler. Place another slice of camembert on each squash half and place under the broiler until brown and bubbly. – Garnish with marjoram leaves. Serves two. When I was done eating, all that was left was a thin piece of pumpkin skin. The squash was sweet and not as wet as our local varieties. I am beyond happy I spotted them. Although I can’t be sure how this would compare to butternut squash in the Western Hemisphere, for now this is as good as I get. You can be sure I will be hounding that market stall for weekends to come. This is my entry for Weekend Herb Blogging, a fantastic event created by Kalyn of Kalyn’s Kitchen. This round is hosted by Chris of Mele Cotte.Happy 4th of July to those of you that celebrate it! Over here we celebrate C’s birthday on July 4! 🙂 Happy Birthday C!! !